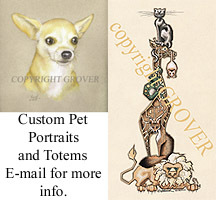 Grover Artwork, beautiful pet portraits! SAFE Haven for Cats, A great cat rescue in Raleigh, all volunteer and they do it right! Nearly Perfect Cat Litter - inexpensive clumping litter that works great! The Hairy Potter, beautiful custom pottery decorated with hair or feathers!